Help students improve their revise and edit skills with this lesson, which includes a checklist and explanation of the common revise and edit acronyms: "CUPS" and "RADaR". Included in the .zip file are 3 .pdf documents. 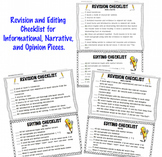 There is a one page revisions/editing checklist for Narrative, Informative, and Opinion writing pieces. The 3rd grade CCSS was used to help align vocabulary and expectations, but it could be used in 2nd-5th as a guide for good writing. This is an editing checklist and a revision I created to go with our grade level writing rubric that we created as a team. 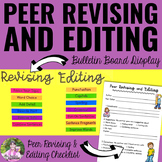 The students can use it to self edit and revise their work, and then it gives suggestion as to how to fix their edits and make revisions. 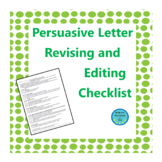 Students use this checklist to revise and edit papers independently before finishing the final draft. Uses the STAR (substitute, take away, add, replace) method of revising and the CUPS (capitalization, usage, punctuation, spelling) method of editing. Do your students dread revising like mine do? Well, there's a fix for that! 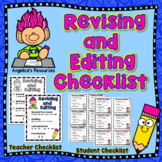 Use this COLOR-CODED Revising "checklist" to help students focus on specific revision tasks. 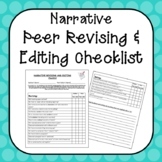 Also included is an editing checklist that students can use independently or for peer-editing. This sheet is used for both revisions and editing for Writer's Workshop. 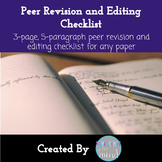 Students can edit their own papers as well as a peer's paper with this handout. There is a section for comments at the bottom. 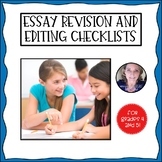 This checklist leads students through a series of revising and editing questions for an expository essay. It also has columns for self and peer editing check-offs, and a space for comments. Great for teaching students to think about their writing before they publish! 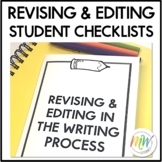 This Revision and Editing Checklist from Read-Write-Rejoice is a self-assessment checklist for students to use when writing literary analysis, research simulation tasks and arguments. It focuses on the PARCC rubric requirements as well as basic mistakes in grammar and mechanics.